Eleni DiMaio moved to Cleveland from Rhode Island in 2006 to study at the Cleveland Institute of Art. There she majored in Ceramics and minored in Bio-Medical Illustration. Her hand-built forms are simple and confident. Her surfaces play with texture and color. She creates porcelain jewelry that incorporates leather and gold, stone ware planters reminiscent of Dr. Seuss, striped with raw clay and metallic self-glazing clay, as well as earthenware platters hand painted with a mix of 60’s retro and country floral designs. 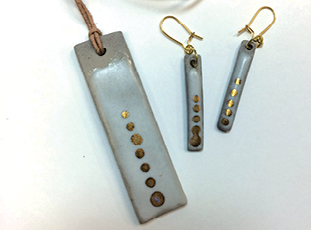 In support of our working artist members, enter our March giveaway for a necklace and earrings designed by DiMaio when you visit this month. No purchase necessary. Congratulations to February winner, Ronnie Jeter.